I have an obsession, with stickers, it's terrible but I do. 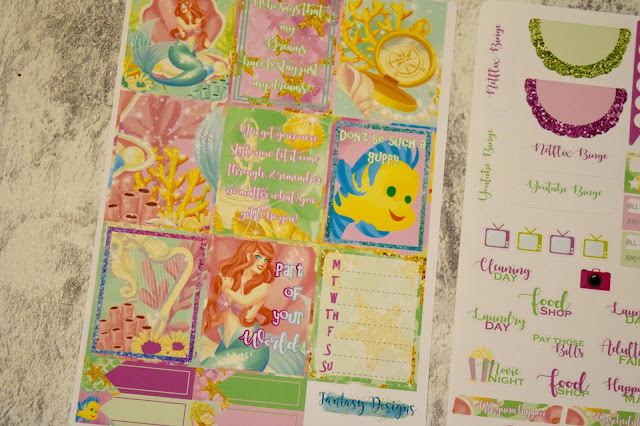 Today I wanted to share with you some amazing Disney stickers for my Happy Planner. I previously shared with you another Sticker Haul and a post about my brand new Happy Planner. Which is all mega exciting. So when Fantasy Designs Store on Etsy, who is mostly dedicated to Disney but also has some amazing other designs as well as some of her favourite films and tv shows, released two new designs, I knew I had to pick them up. Which is exactly what I did! The first was Moana, so I think that's pretty obvious why I picked this one up! It's Moana themed!! 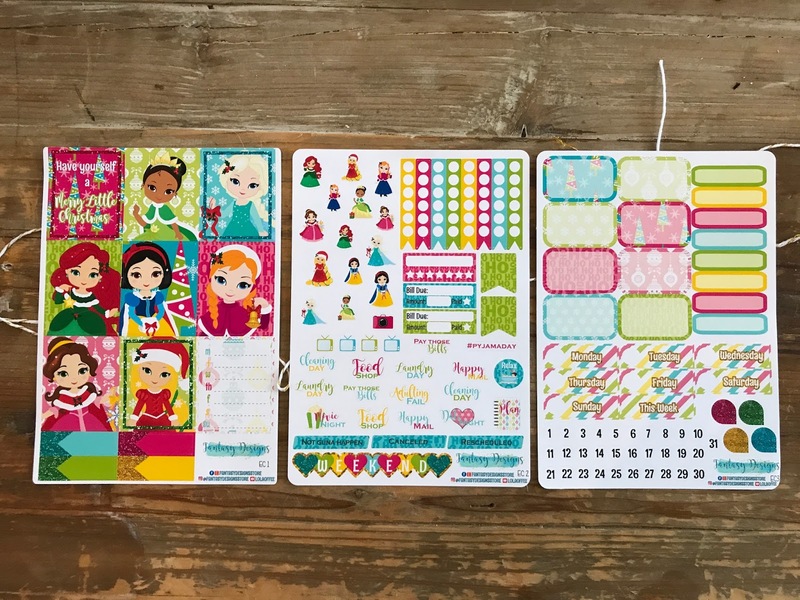 I love the fact that Janine, behind Fantasy Designs, does a smaller kit for the Happy Planner/Erin Condren. With only 9 decorative boxes, some tick boxes and a lot of half and quarter boxes, as well as some decorative stickers - this kit is absolutely just what I need. I feel like I'm not one to completely fill up my pages in my planner, as I wouldn't actually have space to write which defeats the point of how I would like to use it. I have filled up my Happy Planner with sticker sets until the end of October so I imagine I will be using Moana for a week or two in November along with my Peter Pan set which is slightly larger than this one. I may well treat myself to another set if Fantasy Designs releases one more before then that I like. However I will most likely phase into Christmas (yes the C word is coming out, soz) towards the end of November, as you know, CHRISTMAS. This is why I'm wanting to use Peter Pan as it's got a dark blue theme which is quite Wintery. (If you need a reminder, it's here). Secondly, Janine released a Little Mermaid themed kit. I mean, look at Flounder! I was umm'ing and ahh'ing about getting this kit, not because of the kit - it's stunning, but because of money...ha that went well. (I had a discount code and they were reduced as they were a new release anyway). The reason I went for this kit was to go with a mermaid themed one I had put in for September. The colours all go together and I just love how it all looks together. The amazing designs for both The Little Mermaid and Moana are amazing, sometimes I wonder how these girls do it, but Janine has certainly excelled herself again! 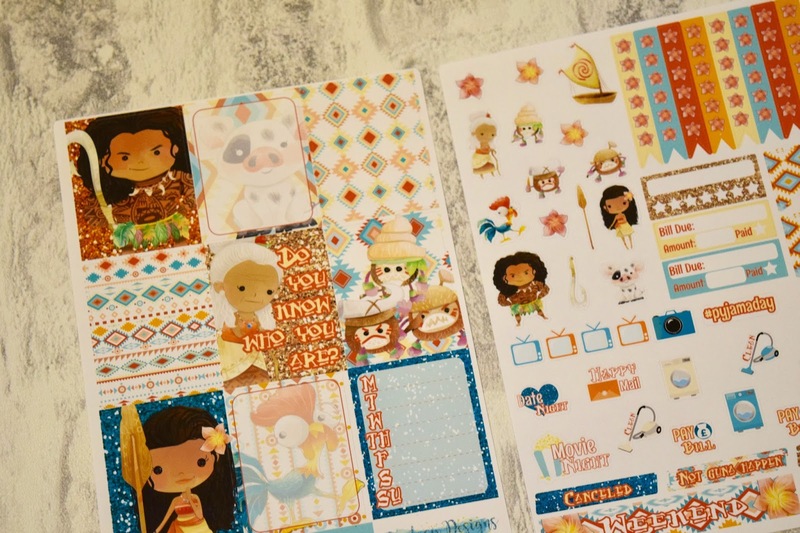 Not one kit is the same and I got two different styles of stickers in the Moana kit and Little Mermaid kit, for example the characters and adulting stickers respectively. It just makes it more different and mixes things up, I think if they were consistently the same then it would take the magic away for me! I am sure that I have mentioned before, but the quality of the stickers from Fantasy Designs is amazing! They absolutely never disappoint and are always cut exactly where they need to be. It's definitely things like this, and of course the mega speedy postage from when I make the purchase, that make me want to re buy from her! 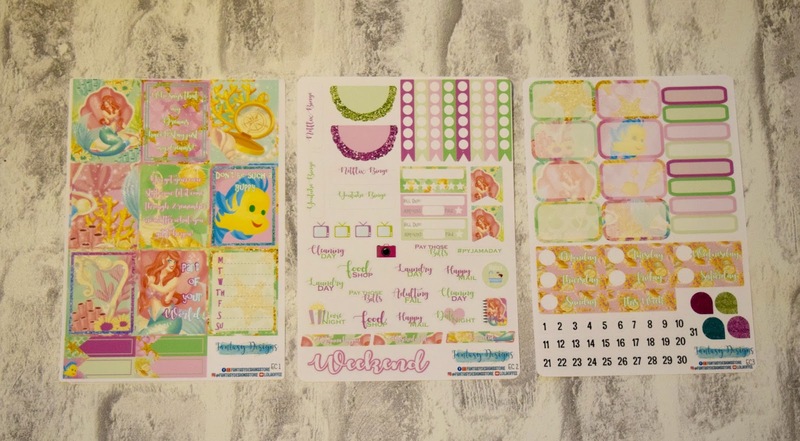 I'm sure I've mentioned it before, I love the cute little samplers, sometimes I wish Sticker shops would do larger sheets of them, but again that might take away the magic from it! 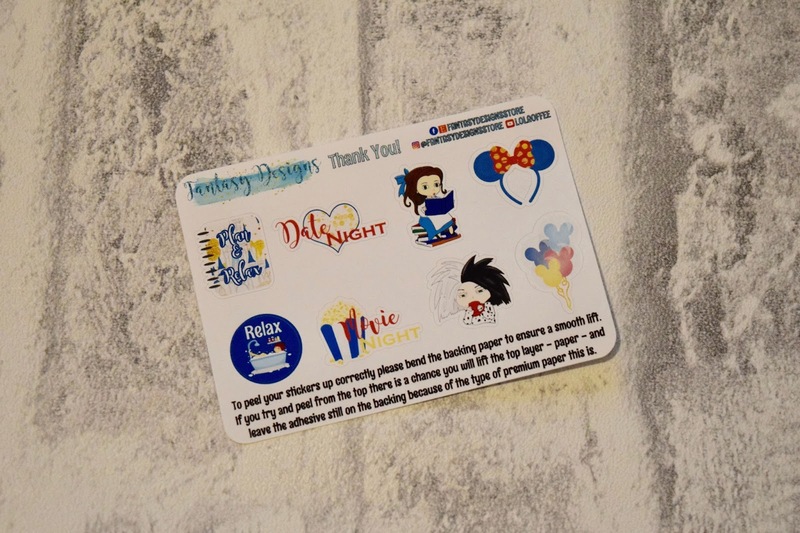 The sample sheet from Fantasy Designs is of course Disney themed and it is adorable! I love the fact that these stickers are always something that I wouldn't normally use, and I love the little Belle reading! On a little side note, I made a cheeky purchase of this stunning Beauty and the Beast inspired bow. The lovely Amy is behind Wardrobe of Wonderland and was so lovely from the minute I purchased till all the time after that as well. I have every intention of wearing this bow like all the time! 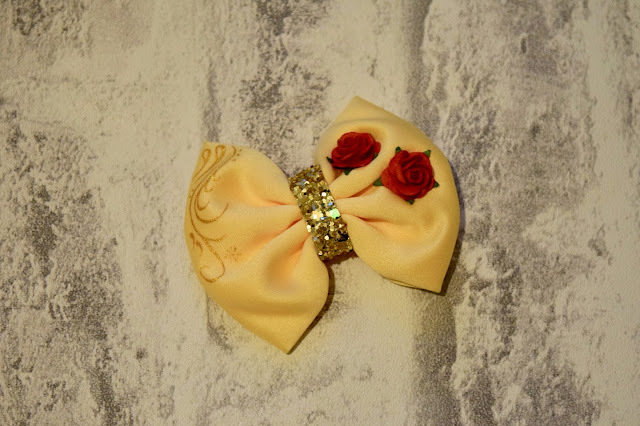 It's handmade, with magic of course, and you can certainly tell how much love and care has been put into making this bow. I am always one to support small independent stores. Who are your favourites? This has been a sad time for me. It feels like the end of an era! I have had a Bullet Journal for going on two years now, it is something I have grown with and created to be something I have needed for me, to help with organising, planning and generally taking notes. However it is time for me to move on. I know this all seems very extreme, but when you have gotten used to something for so long, it takes some time to get used to such a change! But it has been done, and I have moved on from having a Bullet Journal and gone for something that I have wanted for some time, a Happy Planner. In a very simple way, I couldn't keep up with my Bullet Journal, I had so much love for it, it was my pride and joy (honestly...). With my change in job last month and a lot of my time being spent there, I am not able to devote as much time to my Bullet Journal as I would really like to. I am completely ok with that, I completely loved the creative side of my Bullet Journal, but I can also do that with the Happy Planner. 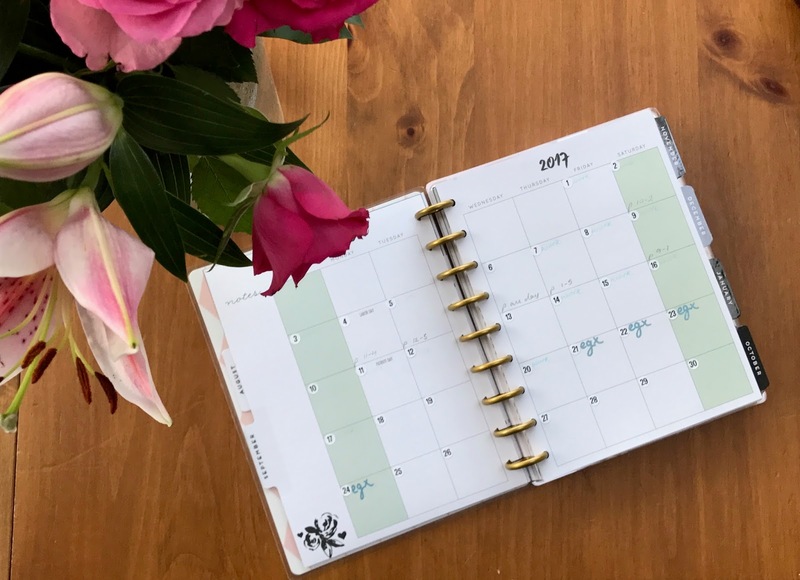 While it has been an expense, it is not one I regret, and it means I can still plan like a crazy person but it is not necessarily quite as time consuming. This is not to say I am not open to creating a Journal again. I do have a notebook set up until the end of the year but I am in two minds about using it! I still have until September to decide what I am going to do, but at the moment I feel like it is not the right thing to do! 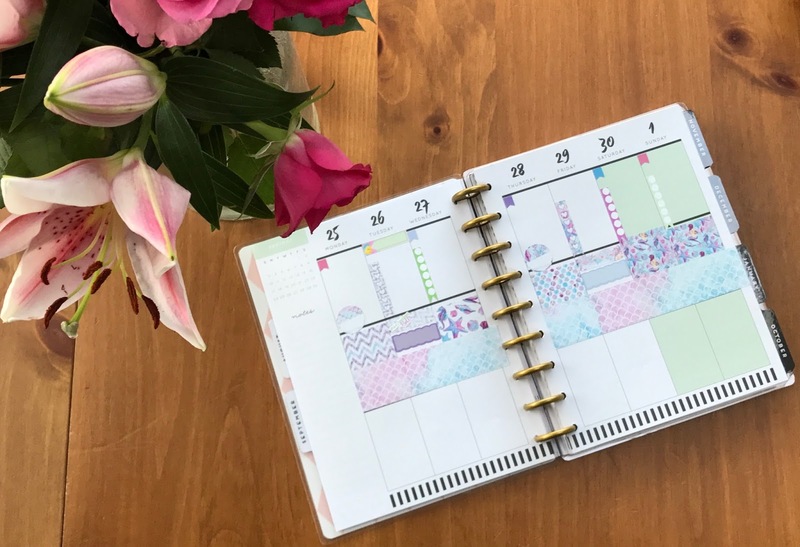 What Is A Happy Planner? 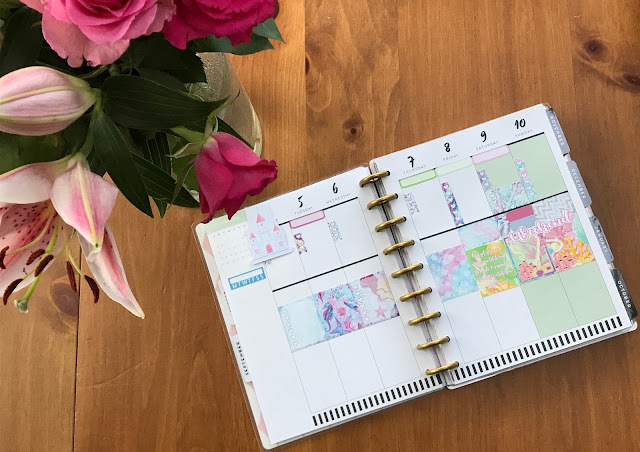 A Happy Planner is very similar to an Erin Condren planner, however as EC are simply out of my budget and personalised greatly I just cannot justify getting one. So I had been looking into getting a Happy Planner and was literally over the moon when I saw Suzy Stick It had a little sale on the Happy Planners she had in stock, and thats when I thought it was the perfect time to place an order! The layout is by month, obvs, with a goals page which was so unexpected and I love! It is then set out weekly, with four or five spreads per month depending on how many weeks the month is spread over! There is then 3 boxes per day, so 3 rows per week, meaning I can split my days up into three sections. 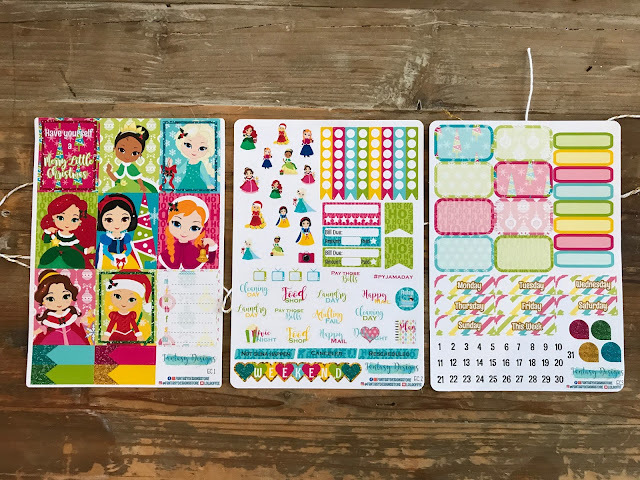 I generally ordered around a good time, as a lot of the Planner Stickers I had been eyeing up were part of shops taking part in a Christmas in July sale, and we all love a bargain. While I did buy a fair bit to get me started and get me through several months, I did get it cheaper than I normally would, so that's a win right? 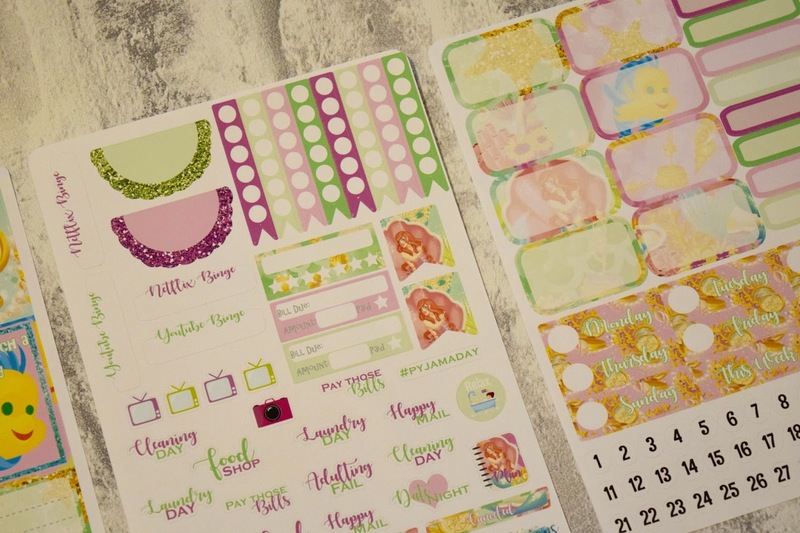 You can see my Sticker Haul for my Happy Planner here, I did purchase many more stickers but stupidly stuck them all in before taking photos, what a terrible blogger I am! 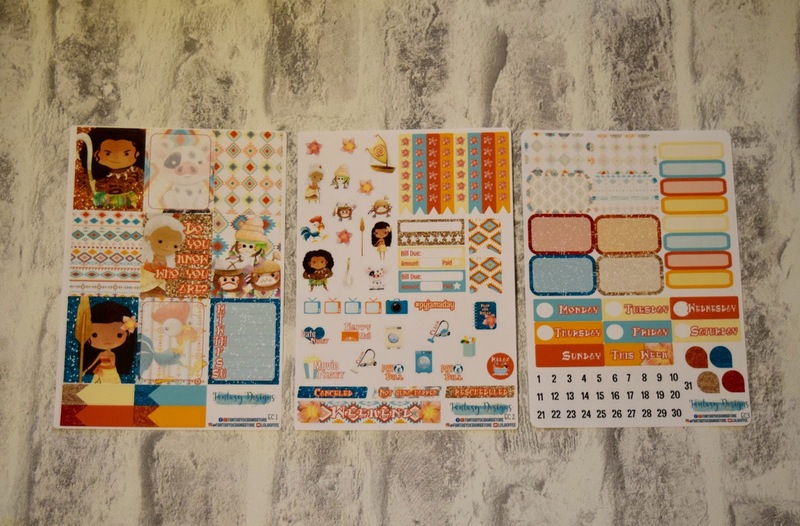 However I do plan on showing how I am using my Happy Planner and this would be a great way for me to show you the other kits I got! 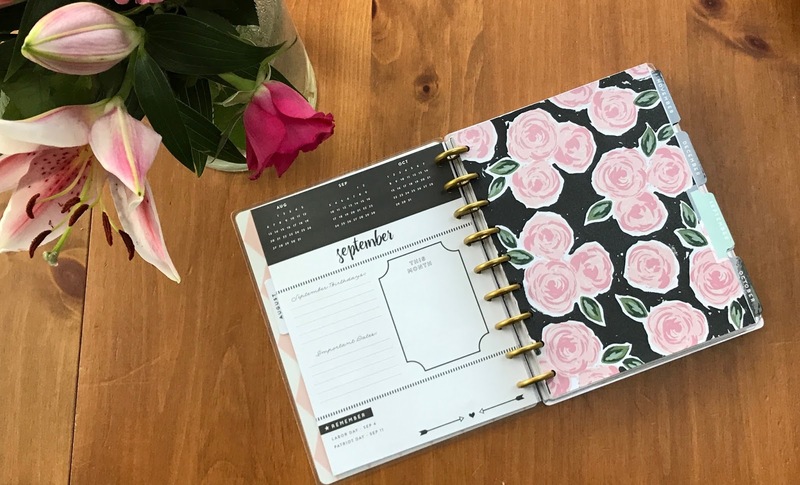 Why I Chose A Happy Planner? I honestly think that this is the best thing I've ever chosen! A month or so ago, my head was a mess, I literally could not get my thoughts together. I was so frustrated and my Bullet Journal wasn't laid out in a way that was working for me anymore. So with the new layout of the Happy Planner, it has made the world of difference. For now, using the layout, I have gone with a to do list at the top, a decorative box and then a meal plan all along the bottom. I have recently seen some other spreads that could potentially mix up what I have done already but I can do it in the future. 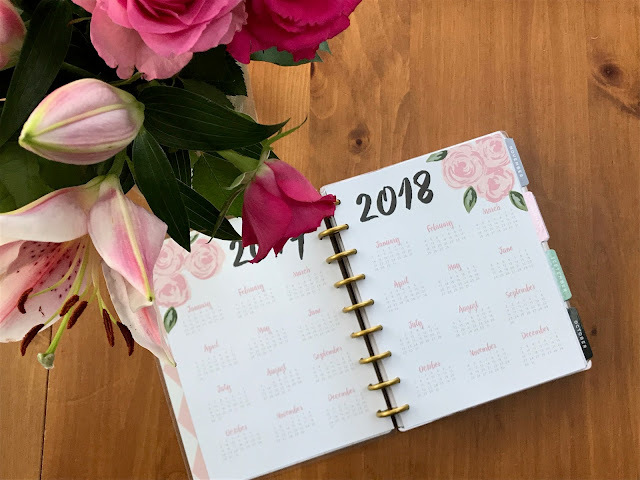 Long story short, I got the Happy Planner because it could organise different aspects of my life, such as general life, studying, blogging and most importantly my meal plan! To state the obvious, to plan of course! As I have mentioned already, I have split the day up into 3 and it means that if I wanted to, I can plan weeks in advance! At the moment my focus is very much on losing weight and it means I can plan out the week of meals to make sure I am eating on plan! Would you prefer to see weekly or monthly updates for my Happy Planner? Is there anything to do with planning you would love for me to share? I have recently ditched the Bullet Journal (only very slightly, I am still doing a separate one), and have gone for a Happy Planner, something I have wanted for quite some time. I bought mine from Suzy Stick It, and she has a whole section dedicated to the range which you can find here. 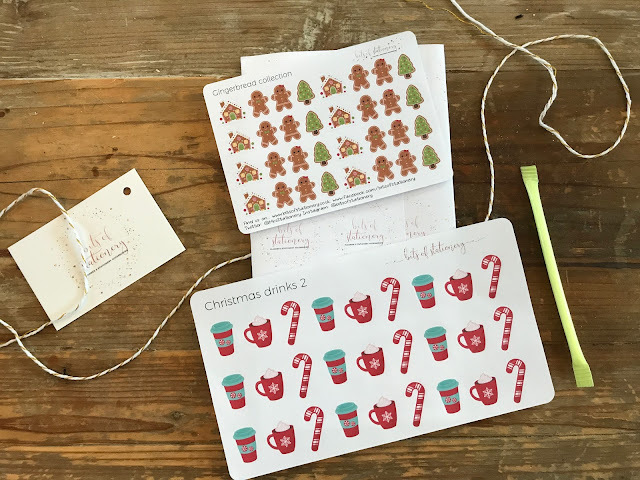 Naturally I needed more stickers, and since there was a Christmas in July sale for some of my favourite shops, I bought some Christmas & Not so Christmas related stickers, that I simply had to share with you! First up, I purchased a few bits from Rachel at Bits Of Stationery. I have been a fan of hers for some time, she opens once a week for a certain amount of orders, she is that popular! Fortunately she stayed open for quite some time for the Christmas in July sale so I placed myself a small order, for just a few bits that I wanted. Her packaging is so on point! You can tell instantly that it's an order from Bits Of Stationery as soon as the envelopes come through the door, I love it! My most recent order came wrapped in Bits Of Stationery paper, wrapped in some pretty white and gold string with a sherbet stick too (Phil got this one, because I'm a top girlfriend..). It's honestly the little things that make all of the difference. Every order comes with a complimentary sticker sheet, the one at the top in the picture, I absolutely adore the summer print of the Planner sticker and the fact it is personalised. I am all about that personalised stuff, then people know its mine and mine only! 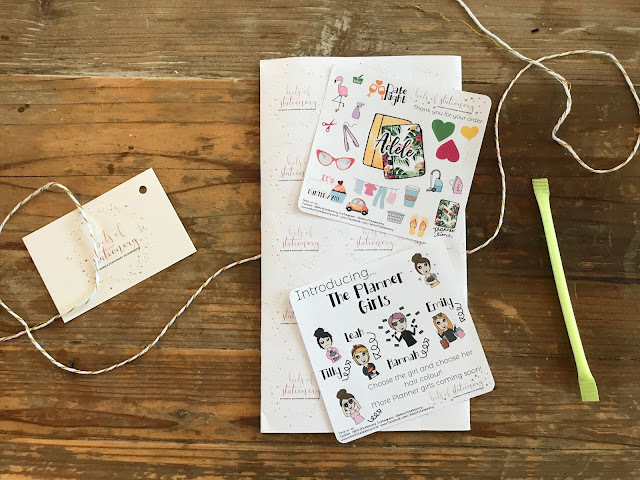 The second sheet that came with my order as complimentary was the Planner Girls sampler, this is something new Rachel has created and my gosh are they creative! 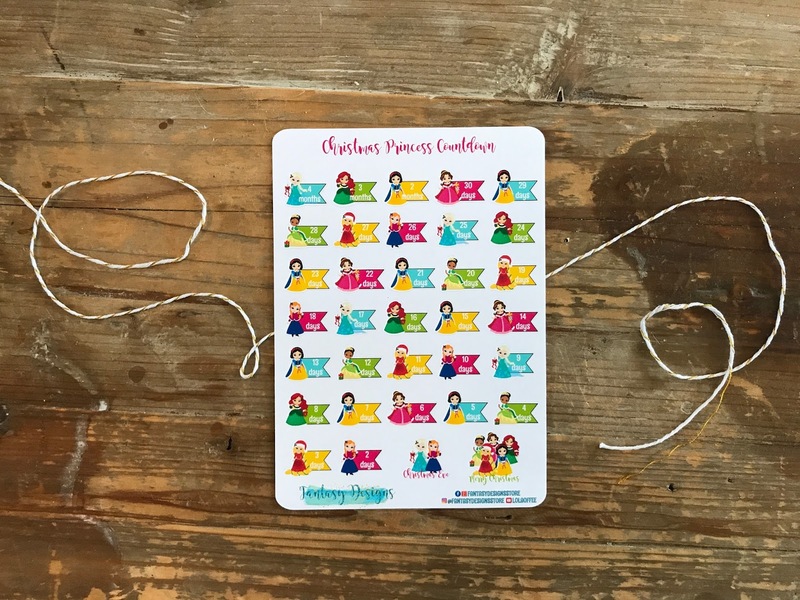 The sampler includes one of each girl, doing different activities and then two extra. Rumour has it she is creating many more and also ones your can personalise! Keep an eye out to see what is coming soon! 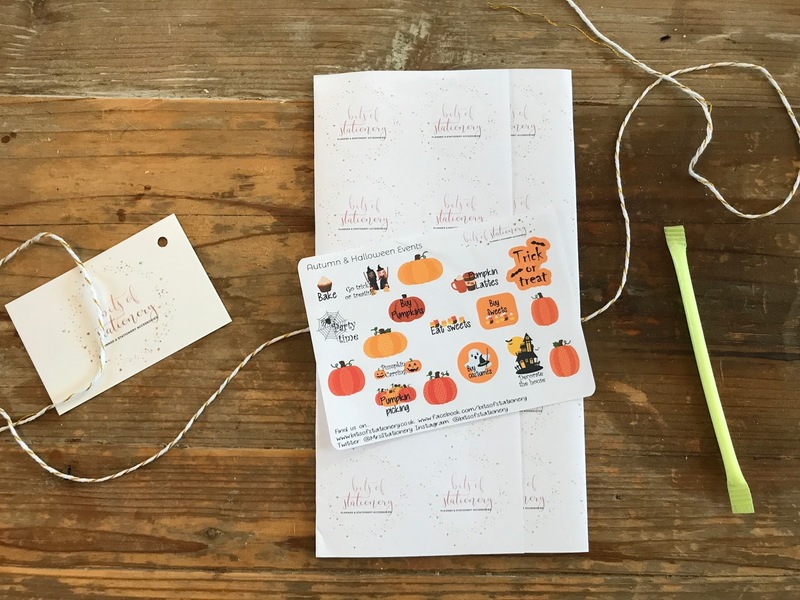 On to what I actually purchased from the shop, these cute little Halloween stickers, a good range of everything. This one is Autumn and Halloween Events, so there is plenty to keep me going throughout October - for Halloween Parties, getting sweets, decorating pumpkins and other exciting things to do! The stickers are all of good sizes, not too big and certainly not too small either which can sometimes be the case when you aren't sure how big stickers come out! I love these, roll on Autumn! Lastly, from Bits of Stationery again I grabbed a couple of Christmas sheets. As soon as Rachel released spoilers in her Facebook group, I knew I had to get them, and since I didn't know when I would get a chance to place another order, I grabbed them while I had the chance. First of all I grabbed the little Gingerbread People and Houses, which are so sweet, they are little which is exactly what I wanted, so if I have a Christmas activity or just generally want something to fill a gap, these are absolutely perfect! Secondly I grabbed the Christmas Drinks Sticker Sheet. With Hot Chocolate and Candy Canes, I really cannot wait to use these! I then placed an order from Fantasy Designs Store, someone else I have been following for some time and I finally had more of an excuse to purchase some of her stickers. The first set I chose was the Neverland Set which you can obviously see is based on Peter Pan, I mean omg look! It looks so magical and I think the navy blue with stars is so cute. I honestly cannot wait to pop this in. I am thinking I will pop this one in for November, as it's quite dark, it will be perfect for Winter! Plus I have some amazing metallic pens that will write over it so nicely. The second kit I ordered was this Princess Christmas Kit, again with some of my favourite Princesses on, it's safe to say this will be used over the week of Christmas. 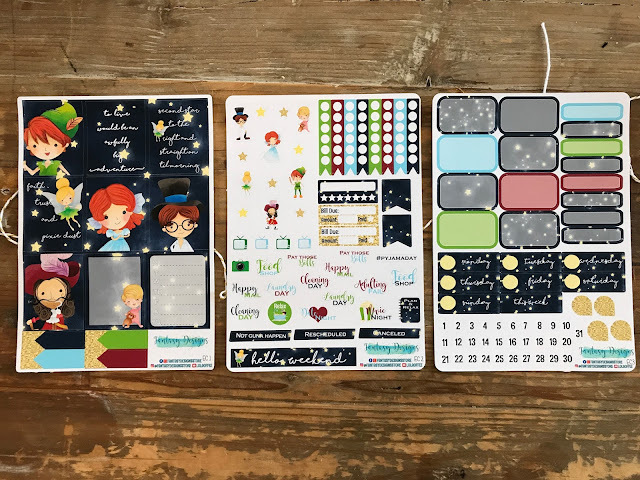 As surprised as you may be, I probably won't be going overboard with Christmas kits like this for the whole of December, and I will hopefully use some more Wintery kits instead to not overwhelm myself! But who am I kidding, I could be far too excited for Christmas that I want more like this! I will decide in a few months time. Last but most certainly not least, I have these Christmas Countdown stickers, with some of my absolute favourite princesses on there, I couldn't resist, it actually starts from 4 months which means I can start putting them in soon. I may well have been told to stop talking about Christmas already so I will leave it there with the Christmas talk...! Which are your favourites? What is your way of planning? Hello! I am back with another post for Yardley London*. Following on from my blog post a few weeks ago on their English Freesia products which I completely fell in love with. I am now back with a second blog post but on their English Daisy* fragrance! As mentioned in my last blog post, the lovely company behind this are Yardley London* who have been producing perfumes, bath and body products using the delicate fragrance of English flowers since 1770. English Daisy is part of Yardley London's Signature Fragrance collection, along with other Scents but I have always like Daisies. They are so pretty and sweet, and the large ones you can get are stunning! The English Daisy is a fresh, dewy and elegant scent which is so Summery and perfect for this time of year as we go into Autumn (yes, I am well and truly wishing for Autumn already). There are top notes of fresh green leaves and apple over heart notes which is a combination of hyacinth and white rose over a base of sandalwood and musk. The top notes come through as the initial impression, with the heart notes coming through after 5-10 minutes and the base notes come through after 1 hour. Daisies represent loyal love and innocence and this fragrance was inspired by Kate Middleton who absolutely loves Daisies, and I can totally see why! Part of the English Daisy range is an Eau de Toilette, very much the same as the English Freesia range too. It comes in an adorable little bottle which is round and has the name simply written on the front. It comes in the sweetest yellow and white spotty box, again simply with the name written on the front, and for 50ml it is £19.99. The second product as part of the English Daisy range is the a luxuriously moisturising Body Lotion, which hydrates the skin leaving it feeling soft, smooth and rehydrated. It has that lovely refreshing English Daisy scent so you have both products to leave you smelling incredible all day long! This 200ml bottle is £6.50, bargain! The Yardley London range can be found in Boots, Sainsbury's, Asda, Tesco's, Argos and online at YardleyLondon.co.uk. The other fragrances in the Signature Fragrance Range are: Jade, Kiri, Polaire, Hermina, Royal Diamond and Royal Pink Diamond. These can also be found online at Yardley London. *These products were kindly gifted by Yardley London, but as always, all views and opinions are my own. As some of you may know, my one goal at the moment is to move out with Phil. We have both gotten new jobs so the plan is for early next year to move in together! This does mean I am on the look out for cute things that we can put in our home. Dandelion Interiors* recently got in touch and I am completely in love with the light* I received from them. To me, it is very Beauty and the Beast'esque, very similar to the Glass with the Rose underneath but instead with lights! I don't currently have a bedside table but I know when I do, this will certainly be going on it. 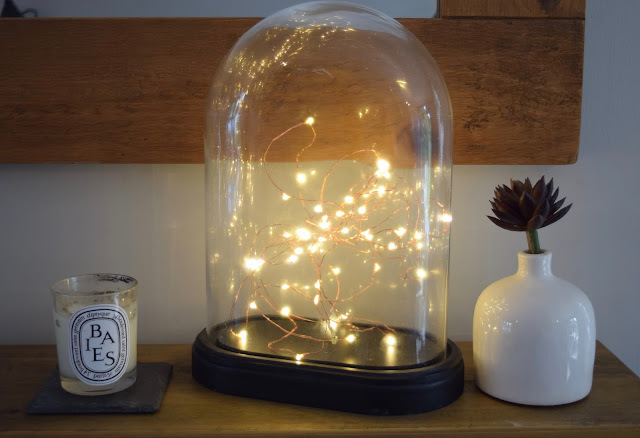 It is so much brighter than you would imagine too, as you would not think that some fairy lights would be this bright, but they are which is amazing! You can find all of their lights here, I wonder if Phil would let us have a Chandelier...! They also have some stunning mirrors on the Dandelion Interiors website which can be found here, I have quite a simple one in my bedroom at the moment but I really like it! For me, I way prefer simple statements rather than completely out there with lots of detail all over them and things poking out! I could completely change my mind one day and really want a statement mirror! But for now I am in love with the gold and bronze mirrors that can be found on the page above! Clocks are not something I have always gone for, I don't have a single clock in my room, unless it is digital, as in on my phone or laptop but I have been considering getting one more and more, and when I have my own place I definitely want one that I can put on the wall. 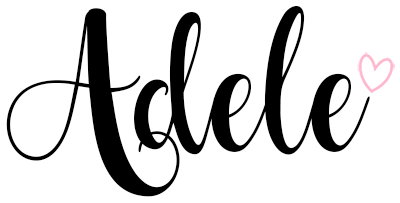 I really like the idea of one with Roman Numerals on it, in either black or gold, can we see a theme here? I also noticed some cute stand up clocks on their website, which I am definitely tempted by. What I love about the Dandelion Interiors website is the amount of quirky products they have on there. It is so nice to see a website that has products that are completely different to anywhere else and the chances are you won't be able to find them anywhere else either. It has definitely made me consider what I would like for my home, and I can't wait to make the decisions with Phil when we get to them! *This product was kindly gifted by Dandelion Interiors, but as always, all views and opinions are my own.